Otto Warburg was a Nobel Prize-winning German biochemist who championed the hypothesis, which we now know as the Warburg Hypothesis, that cancer is caused by cells switching from the respiration of oxygen to the fermentation of sugar. This was in 1924. This criteria has largely been relegated to a correlation, since with the advent of molecular biology we learned about mutations in DNA. It has been a controversial topic, and for what it's worth, there has been a 10-fold increase in articles related to the Warburg Effect over the past ten years. In this study (see reference below image), the authors link yeast cell fermentation to the oncogene Ras. They not only correlate an influx of glucose with accumulation of fructose 1,6-bisphosphate and activation of Ras, they show that fructose 1,6-bisphophate triggers activation of Ras. This supports the Warburg Effect within the modern context of at least one way in which we understand cancer to work. 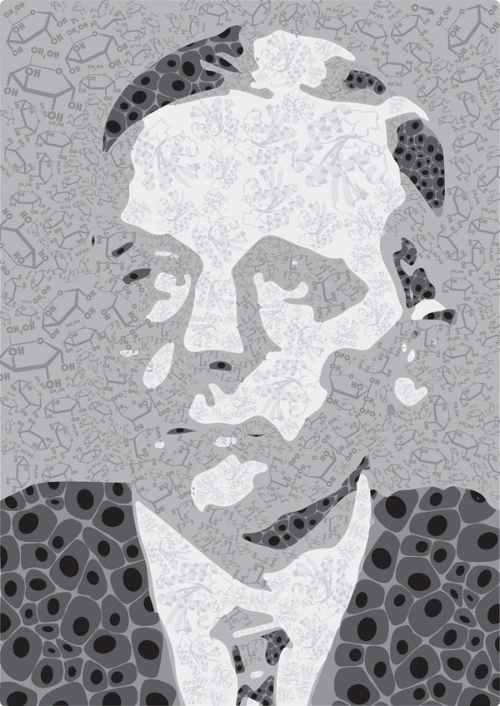 The image here incorporates glucose, fructose-1,6-bisphosphate, proliferating cells, and Ras into a portrait of Otto Warburg. Only after the completion of this illustration did I realize that he studied chemistry under Emil Fischer, known among other things for drawing sugars in, that's right, Fischer projections. Had he studied under English chemist Sir Norman Haworth then it would have been apropos indeed. So it goes. Nat Commun. 2017; 8: 922.